My relationship with Himalaya skincare has always been a love and hate kind of. I used their "neem face wash" which used to be a gel like clear product with green colored scrubbing particles when I was in high school and breaking out terribly and it did wonders for my skin. Some time later I bought some face wash which was in the cream form ( I don't remember the exact name because it has been nearly 7-8 years now) and I actually threw that away because it smelled like shaving cream and did nothing to clean my skin. I never felt like trying any other product from Himalaya for so many years but just recently I have been seeing a lot of positive reviews about their new products which are floating everywhere on the Internet so I thought of giving them a try for a second time. 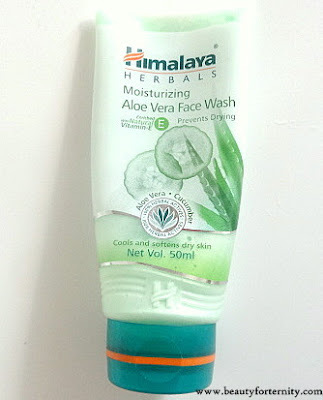 The product which I tried and is going to be reviewed on the blog today is "Himalaya Moisturizing Aloe Vera Face Wash"
Available at: Nykaa.com and offline cosmetic shops etc. Packaging: Himalaya Moisturizing Face Wash comes in a tube like packaging which has a green coloured flip-open cap which closes securely and easy to open as well. The packaging is simple and sturdy and travel friendly. You can track the amount of product left through the clear tube at any given time and come to know when you have to buy a new one. Fragrance: It is a faint green colored, cream like product with an artificial herbal fragrance which feels strong in the beginning but fades away soon. I love it's fragrance but at the same time I feel that it can offend sensitive noses. Consistency: It has a medium, cream-like consistency and is easy to spread on the face. How do I use it: I take a very little amount of this product and spread it on my fingers and apply it using circular motion on my damp face and massage it for 2 minutes and wash it off with lukewarm water. It feels like using a moisturizer to clean the face because it does not form any lather. Sometimes I do need to use it for a second round when I have come out from outside and have extra dust and oil accumulated on my face. It gives a cooling sensation to my skin which may be because of cucumber and menthol which are present in the ingredients. I feel so refreshed because of it's cooling effect and the fragrance it has. It's easy to wash off with water and leaves the skin clean and soft without any stretchy or dry feeling. I have combination skin with oily forehead and nose and dry cheeks and it suits my skin quite well. It cleanses the skin well if you don't have any makeup on but does not work up to the mark if you are wearing makeup. You have to use a makeup remover prior this or toner or some soap based cleanser. For everyday purpose, it works fine though. I use it twice a day as it has been instructed on the packaging and have not experienced any breakouts or allergy or redness. I don't have to apply a moisturiser immediately after washing my face with this Himalaya face wash which I really liked because my skin feels super dry when I wash my face with soap based products. It works perfectly for dry skin but I am not sure about it's efficacy for oily skin. People with oily skin can try "Lakme Clean Up Clear Pores Face Wash With Green Tea Extracts' which has already been reviewed on my blog. Overall, Himalaya Moisturizing Face wash is a mild face wash that actually has a Moisturizing effect on the dry skin and suits combination skin too. It is mild enough to be used twice daily and does not make the skin feel dry or devoid of moisture. Hence, it can surely be bought for upcoming winters. Being affordable it can be given a try without burning a hole in your pocket. Beauties with dry skin must give it a try but for oily-skinned it can be a disappointing.